Hydrocotylaceae (Drude) Hyl., nom. cons. The Araliaceae are a family of flowering plants, also known as the Aralia family (after its type genus Aralia) or ivy family. The family includes 254 species of trees, shrubs, lianas and perennial herbaceous plants in two subfamilies. 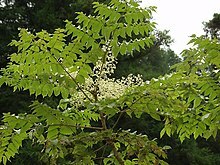 Species usually bear pinnately or palmately compound leaves, and usually have small flowers produced in large panicles. This page was last changed on 20 August 2016, at 02:36.